Mamayev Kurgan is a Memorial Complex and a symbol of heroism and patriotism of the Soviet nation. Kurgan is translated as the burial mound. The highest top of it is 102,0 meters; for this hight soldiers fought in the most fierce battle of the world's history — the Battle of Stalingrad. From the top of the Mamayev Kurgan, the whole city has been on the palm of a hand. The top location would have given an unprecedented advantage to the enemy troops. At the bottom of the hill have been located plants, which were of strategic importance for both armies: plant "Red October", tractor factory, plant "Barricade", and Chemical plant "Lazur'", which has not been reconstructed since then. 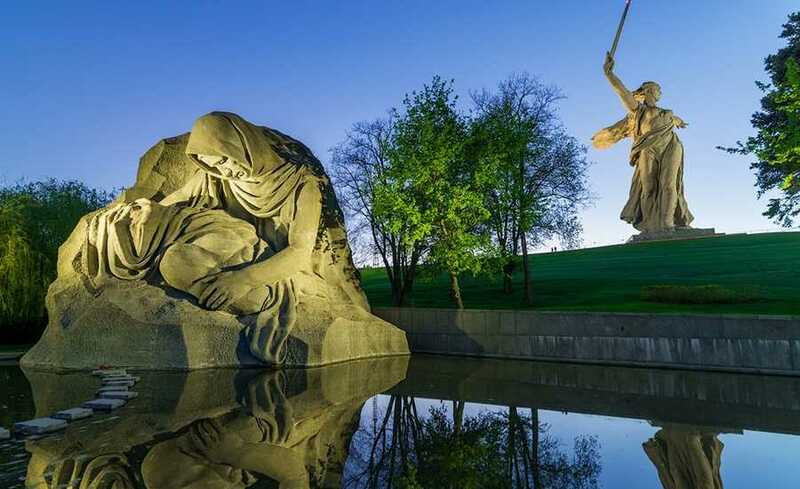 The Memorial Complex "To the Heroes of the Battle of Stalingrad" (the Stalingrad is the former name of Volgograd) of Mamayev Kurgan stretches from its foot to the top, forming the hight of 820 meters. The ensemble starts with the introductory composition "Memory of Generations". It is a vast high relief (17m x 3m x 0.75 m), which consists of 11 figures. Further, it continues with the Avenue of Lombardy Poplars, "Fight to the bitter!” Square, Symbolic Walls — the ruins of Stalingrad, Square of Heroes, the Monumental Relief, the Military Honour Hall, the Square of Sorrow, the Military Memorial Cemetery and the key monument — "The Motherland Calls!". The Mamayev Kurgan is the cultural heritage site of the World's importance. It has been included in the UNESCO World Heritage List in 2014.